Two words that press the panic button in countless men’s hearts. The stress of not having a gift, not having a gift that she will love, or not knowing where to shop for the “perfect gift” are worries that would stress St. Valentine himself! Fortunately, for those looking to save their reputations as thoughtful romantics, Bowties Style is here to save the (Valentine’s) day! We have a selection of gifts that are sure to warm the heart of your paramour. Choose from many beautiful pieces of jewelry available to fit into any budget. Your girlfriend will be overjoyed when she unwraps an artisan bracelet or necklace as unique as she is. Is your lady sick of all the cold and snow? If so, she’ll love one of our new spring scarves ($30). Choose a scarf to accent her favorite outfit, and she’ll know you’re thinking of her! Bowties Style offers a wonderful array of Chan Luu jewelry – from wrap bracelets that are ideal for every day wear to necklaces that look fantastic with casual or dressy apparel. The popular and versatile Vince tee is a great gift option. Personalize her look with a spring scarf or a long necklace. If the gift needs to say “you are mine forever,” Bowties Style can help with that, too! 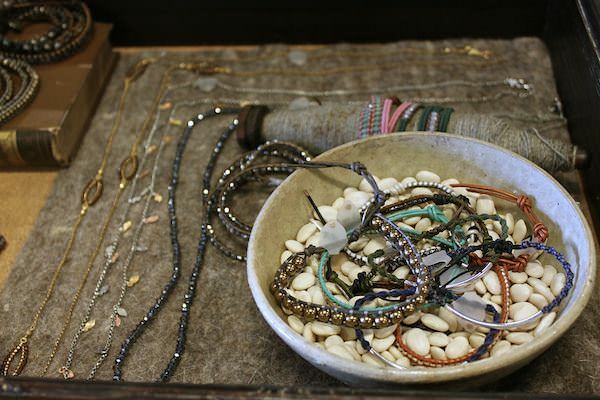 The staff at Bowties will assist in finding the perfect handcrafted jewelry combination. She will cherish this special gift for years to come. All gifts at Bowties Style are wrapped with a beautiful bow and ready to present to your Valentine. All that’s left is to sit back and enjoy the affection!